This afternoon the sun is shining so I thought I'd go out and do some work in the garden. Yes, there are still patches of snow around but the garden is calling me. So, I bundled up and started to work on the medicinal and magical perennial herb garden. I raked a bit and pulled up some grass that had gotten in among the plants. It's amazing how easy it is to pull up grass this time of year. I can see signs of the lemon balm showing and the lovage is just about ready to break ground. The cats were all out cavorting around and seemed quite excited to have there human outside with them. What a great feeling to be out at the earth once again. I'm not long back from another week in the city. Himself is still hospitalized. The infection in his wound appears to be healing and he sounds and looks much better. Unfortunately he got hit with another thing, a Super Bug. So he ended up with a blood infection. I don't know how he's managing to cope with it all. We still have our fingers crossed that he will be able to get the defibrillator put in soon and then come home. Robins have been sighted and the woodpeckers are drumming so it surely must be spring. 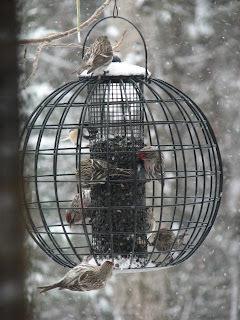 The redpolls have been here each day lately. 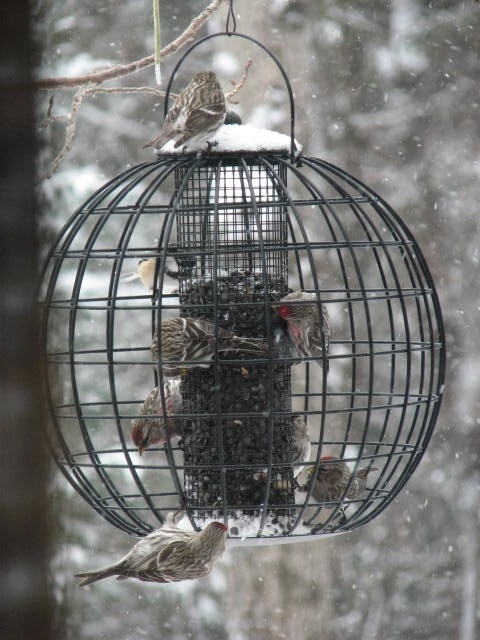 We had snow one day last week and they were filling up on the sunflower seeds. That's about it for now. Hope you're enjoying Spring where ever you are.